As your DWI defense attorney, I will negotiate alternatives for the penalties you face in Troutman. If you have been arrested for drinking and driving, having an expert defense lawyer on your side can make a big difference in the consequences of your case. When you come to me, W. Sloan Goforth, Attorney at Law, I will provide the DWI defense that you need to increase the chances of you receiving reduced charges and penalties in Troutman, North Carolina. Driving while impaired can bring about many severe consequences, and if convicted of your charges, you may be required to spend time in jail, pay a significant fine, and/or complete court-ordered community service. Additionally, your license may be revoked and your car insurance rates may rise significantly. As your DWI defense attorney, I will negotiate alternatives for your charges and the penalties you face, as well as advocate for your best interests to ensure that no evidence that could mitigate your charges is overlooked. As your DWI defense lawyer, I am also available to answer your questions and provide reassurance before, during and after your case is heard. I am dedicated to understanding your problems and needs as you take action after a DWI. Knowing that you have me, W. Sloan Goforth, Attorney at Law, on your side will help you achieve your goals and face reduced penalties, rather than trying to handle these matters on your own. If you were recently arrested for driving while impaired, contact me today for a free consultation and to get started with your DWI defense. I will work with you to protect your finances, your reputation, and your freedom. 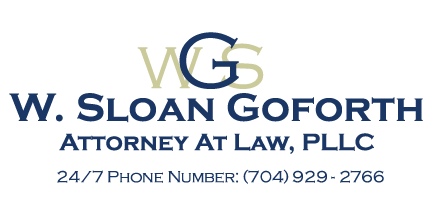 At the office of W. Sloan Goforth, Attorney at Law, we can help with legal cases regarding DWI defense for residents of Statesville, Troutman, Taylorsville, Mocksville, Mooresville, Hickory, Iredell County, Alexander County, and Davie County, North Carolina.